I get a lot of different emails from swimmers, people who'd like to swim, swimming companies and other fitness organizations asking interesting questions, promoting their products and services. Some of them are too good to be lost and forgotten in my inbox, so I decided to start sharing the more useful information on the Swimator Blog. Introducing "From the Swim Bag", a semi-regular round up of curated swimming information. It is not an every day thing to buy a swim suit, especially if it is customized to your liking. However, as it is with other clothing and accessories, fashion does not sleep and swimming is no other, so why not create a swim suit based on your desires. 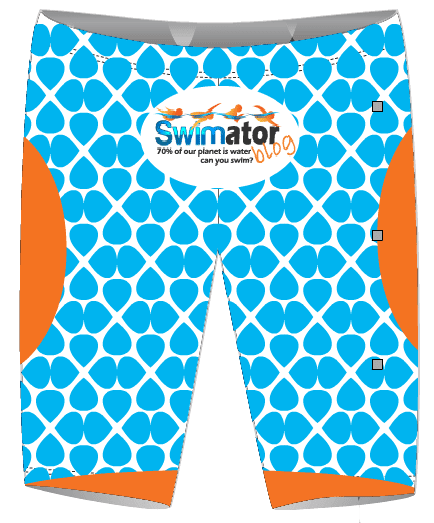 FINIS, a swimming equipment company, just launched a new product: The Custom Swimwear Design Studio! which will let all the swimming enthusiasts out there to design a unique swim suit, drag suit or swimming cap. With easy step by step instruction, it is easy as one to three to have a newly fashioned swim suit designed shipped to you. 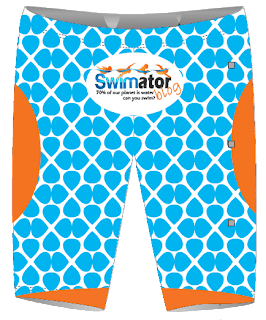 Check out the quickly put together Swimator Blog suit design. You can let your imagination run wild. There is an opportunity to win a free swimming cap on our Facebook page. When the fan count reaches 300 a drawing will be made out of the last 20 Likes and one lucky swimmer will receive a free swimming cap. At the time of this writing, there are only 3 spots left, so hurry up and become a fan. To keep up with the swimming for health trend of this blog, I figured it was very appropriate to post the following statistics about our sedentary job. This does not apply only to Americans, but most developed countries in the world. Why couldn't swimming be an answer to the problem? Go for a 30 minute swim during a lunch break or jump into your local swimming hole for a quick dip after work. Do not become a statistic and learn to enjoy swimming. What a great contest! I could definitely use some of these swimming pool accessories!